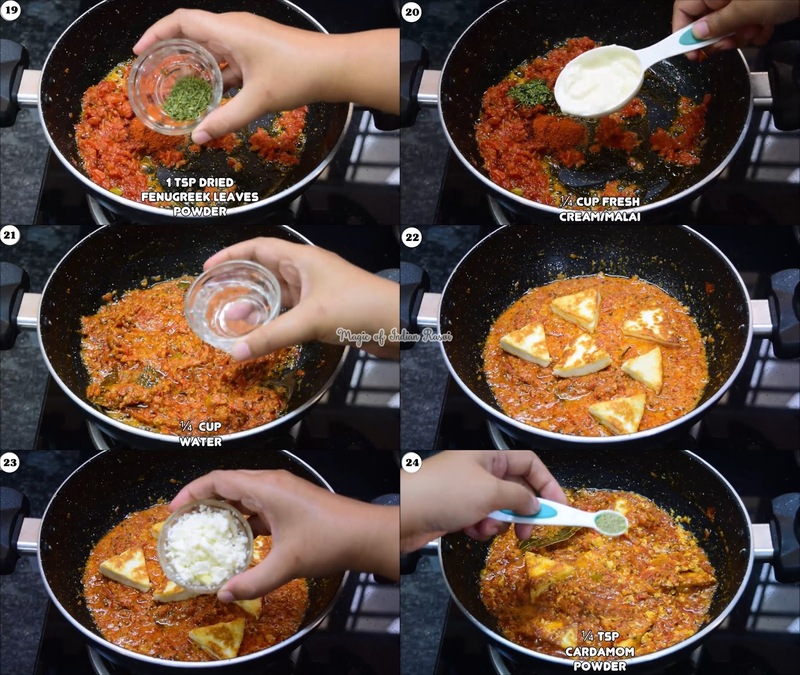 A quick Paneer Kadai Sabzi Recipe which can be made in a jiffy. It is sure to tantalize your taste buds as it tastes exactly like restaurant one. Paneer is sauted in butter and ghee which gives this dish a royal taste. Tomatoes are cooked to perfection which further enhances the flavors and finally it is finished with a touch of cardamom powder! 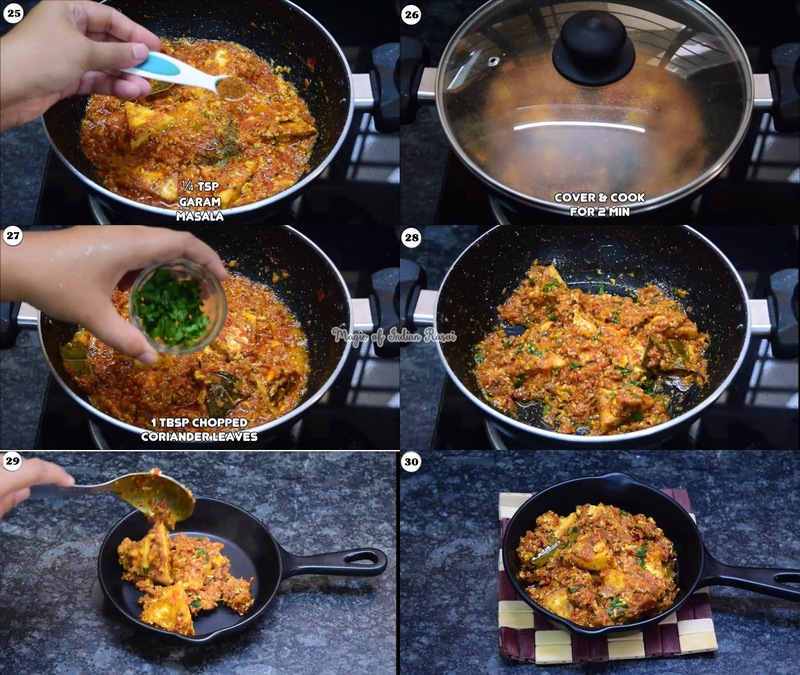 Do try this easy Paneer Kadai Sabji! In a pan/kadai, heat 1 tbsp butter and 1 tbsp ghee. 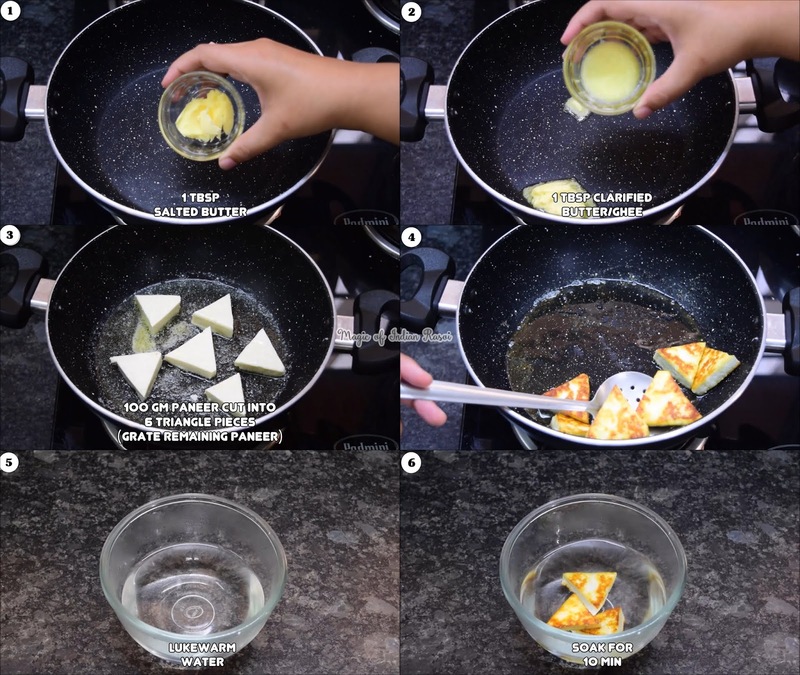 Add paneer pieces and shallow fry till golden brown on both sides. Remove and soak in lukewarm water for 10 min. Gently squeeze extra water and transfer to a bowl. Keep aside. 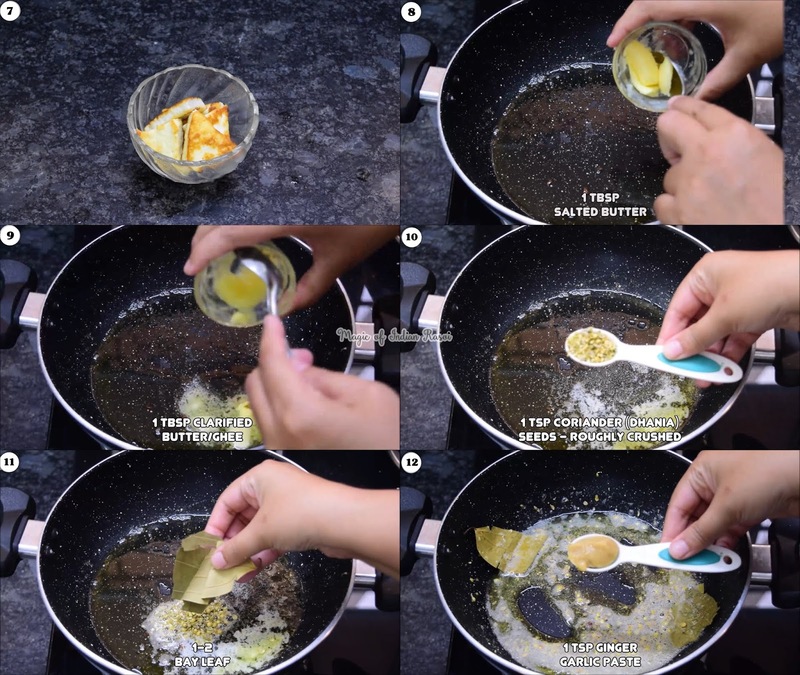 In the same kadai, add 1 tbsp butter and 1 tbsp ghee more. Add coriander seeds and bay leaf. Saute for 30 seconds. Add ginger garlic paste and saute for 30 seconds. Add chopped tomatoes, salt and ¼ cup water. Cook on medium flame for 5-6 min. 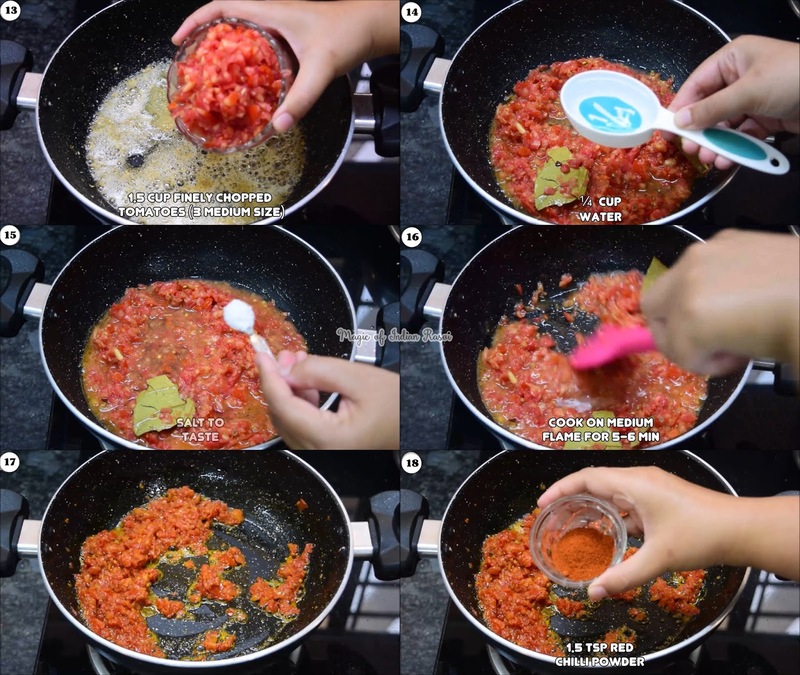 Add ¼ cup water more and cook till fat separates from the tomatoes on medium flame. Add red chilli powder, dried fenugreek leaves powder and fresh cream . Mix well. Add ¼ cup water or more to get desired gravy consistency. Add sauted paneer pieces and grated paneer. Add garam masala and cardamom powder. Mix. Cover and cook for 2 min. Serve hot with your favorite roti, paratha or naan!